Michael Mann is one of the most influential sociologists writing today. His three-volume work The Sources of Social Power, the third volume of which has just been completed, has transformed our way of thinking about power and has rewritten the history of human societies. No one interested in understanding how the modern world was shaped, how we got to where we are today, and where we're likely to be heading can afford to ignore this modern classic. Michael Mann is, as John Hall aptly describes him, "a Max Weber for our times." In this new book Michael Mann reflects on the meaning of his project as a whole, both as a contribution to social theory and as a guide to the options and constraints that face the contemporary world now and in the near future. He gives sustained attention to the situation of the United States, the nature of the challenge that may come from China, the unrestrained and perhaps unrestrainable power of finance, and the looming crisis of environmental degradation. This concise and accessible book is the ideal introduction to the work and thought of one of the most original social scientists in the world today. Students and scholars will find the book invaluable, and general readers will find in this book a clear and masterful guide to the key challenges we face in the years and decades ahead. Part One: Powers in Motion. Chapter Four: An End to Ideology? Chapter Five: Patterns, Cages, Interstices and a Dialectic. Part Two: The Nature of Social Change. Chapter Six: States, Strong and Weak. Chapter Nine: Contingencies of Modernity. Chapter Ten: Our Looming Crisis. "A very stimulating and thought-provoking book." "This superb short book deserves the widest readership. 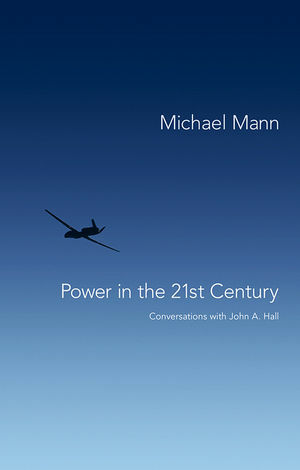 A profound understanding of the structures of power in our own age allows Michael Mann, in a brilliant dialogue with John Hall, to offer rich insights into the likely developments of an age that we cannot yet know." "Michael Mann has exceeded all of his contemporaries in making sociological sense of Western history, something he has done quite systematically up through the outbreak of the First World War. In these conversations with John A. Hall, he digresses from his nearly completed volume on times since that to cast an insightful gaze on current history, to speculate incisively about the shape of things to come and to draw some major conclusions about history and power." "Wielding his four-dimensional template of power, Mann illuminates the world history of recent times and the foreseeable future. Events become turning points when leading power sources intersect: capitalist crisis with world war in the early 20th century; the stalemate of pluralist politics with ecological crisis in the 21st. Mann displays here in summary strokes the continuing relevance of his grand sociological vision." Michael Mann is one of the top sociologists in the world today, and probably the leading figure in comparative and historical sociology. He’s particularly well known for his projected trilogy on the sources of social power, a sociological history of societies from the beginning to the present, the first two volumes of which appeared in 1986 and 1993 and the third is due to appear in 2011 or 2012. This book is based on a series of conversations between Michael Mann and John Hall. The conversations explore Mann’s highly influential account of power and enable Mann to develop his views on the changing forms of global power in the late 20th and early 21st centuries, covering topical themes like the end of the Cold War, the rise of the American empire, the growing power of China and India, the wars in Iraq and Afghanistan, the global financial crisis and the looming environmental crisis. This topical and wide-ranging book provides the reader with a very accessible analysis by one of the world’s leading social scientists of the major forces that have shaped our world over the last half-century.